From Maryland comes the 19th site honored by the United States Mint&apos;s National Park Quarter Program. The Fort McHenry Quarter was released August 26, 2013. 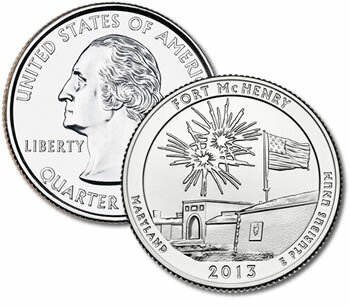 The Quarter&apos;s design features the Defenders Day celebration at Fort McHenry with fireworks. Inscribed are FORT McHENRY, MARYLAND, 2013, and E PLURIBUS UNUM.